One Keynote Speaker at the 17th annual Kutztown University Children’s Literature Conference is author Mara Rockliff. Mara will walk less than one block from her home on Walnut St. to campus. If you want to hear her talk, don’t knock on her door, come to the conference on April 18. Cookie-like art © Vincent X. Kirsh for Gingerbread for Liberty. Thanks to Firefly Bookstore, Kutztown’s hoppin’ indie bookshop, Mara’s Gingerbread for Liberty launched at KU’s PA German Heritage Center. That location made sense as her picture books are grounded in history and geography. We got a sneak peek at her newest picture book, Mesmerized. It recounts a duel of wits in Paris between Ben Franklin and Otto Mesmer. Mara’s Me and Momma and Big John was illustrated by William Low. The book is a loving tribute to the first woman stone-cutter working on NY’s Cathedral of St John the Divine. Low is also coming to the KU conference from his home near NYC. Low is one amazing painter, adept with both the traditional paint brush and now the digital tablet. The artwork for ‘Me and Momma’ is 100% digital, which surprised me. You may already have a collection of William Low art in your home. He created the ‘Winter Flowers’ stamps for the U.S. Post Office. Forever Stamps USPS by William Low. Another New Yorker coming is illustrator Elijah Cooper. A Yale grad, Cooper parlayed his Ivy League education into a job as a go-fer at the New Yorker Magazine. He paints in a lyrical watercolor style that appears deceptively simple. His Beach won the Society of Illustrators Gold Medal. Dance! was a New York Times Best Illustrated Book of the Year. Other books include his memoir of fatherhood: Crawling: A Father’s First Year. Cooper is the author/ illustrator of local favorites including Farm, A Good Night Walk, Magic Thinks Big, and Homer. Farm, cover art © Elijah Cooper. Young Adult Novels by Gary D. Schmidt. I’ve been on the lit conference committee all 17 years. One of my specialties is logistics, meaning I pick up authors at airports, or walk the illustrators from the Bieber Bus station. The committee thanks me profusely, but I really enjoy it. I will pick up Gary D. Schmidt at the airport when he arrives from Maine. I admitted to my colleagues that I was unfamiliar with his work. My Bad, his Wednesday Wars is a Newbery Honor winner and a fave of the committee. I went over to Rohrbach Library to find his books. Guess what? I found a literary bio he wrote about Robert McCloskey, of Make Way For Ducklings fame. This may not be Schmidt’s most popular book, but I found it fascinating. I’d already read how Robert McCloskey drew real ducks on the floor of his Greenwich Village apartment. But according to Schmidt, he fed the ducks red wine to try to slow his models down! Besides Mara Rockliff, two more local Kutztown authors will debut books at the conference. Lisa Kahn Schnell is author of High Tide for Horseshoe Crabs and Kevin McCloskey, (I just love him, -he’s me) will share his Toon Book, We Dig Worms! 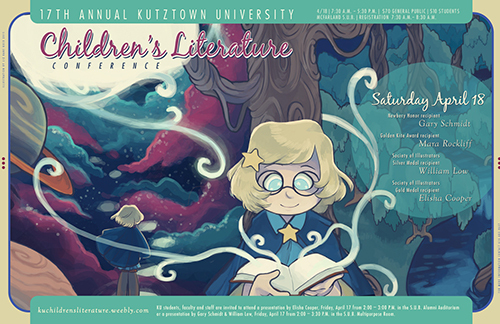 The KU Children’s Lit Conference needs your support. The overall economy has improved since 2008, but Pennsylvania education funding has never rebounded. School districts no longer routinely reimburse teachers for professional development expenses, such as educational conferences. It’s easy to blame this on Gov. Corbett and Tea Party Republicans, but Gov. Rendell left PA with over a billion dollars in unfunded teacher pensions. Gov. Wolf says education is his top priority. Let’s hope so. We have enough prisons and casinos. Illustration by Liz Kane, design and type by Prof. Elaine Cunfer. Kutztown University students can attend the April 18th conference for just $10. Teachers, librarians, authors, and other professionals need to pay $70 at this point. It promises to be an exciting event with top-notch speakers. Registration info can be found here. Next > Student Artists heading for MoCCA, NYC.